Mariano is a dragon who must collect five keys in order to release his friends from captivity. In his quest he will have to avoid dangerous robots and traps and also collect some other items that will help him to progress. In this colourful and fast-paced arcade adventure, the player has 80 lives to complete the mission, and although this may sound like a lot of lives, they might prove to be too little! Besides being colourful, the graphics are cute, cartoon-styled and with a fine quality of detail. In the title screen a nice tune plays, but during the game there are only sound effects, which sound OK. The gameplay is pleasant and the game is rather large. The grab factor is well above average; it is a game that gamers will most probably enjoy! 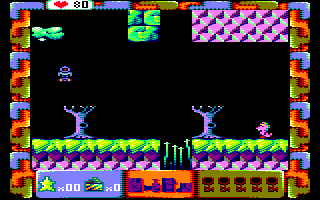 On the whole, Mariano is a game that was made with care and imagination by ESP Soft and certainly scores fair enough. Turtles are invading the plumbing factory where Mario and his brother Luigi work, and they have to rid the factory of them. They do this by jumping and hitting their heads on the platforms (ouch!) so that the turtles flip over and are knocked unconscious – then they have to walk over to the turtle to remove it. When all the turtles are removed, it's on to the next level – which is more of the same. This is certainly one of the worst games to feature Mario and Luigi; it's one to forget about. The playing area is rather confined and it's difficult to reach the turtles in time when you've knocked them out. The graphics are poor and there are very few sound effects. Go and play one of the countless other Mario games on Nintendo's consoles instead. Stéphane Marlow is a detective who has been given the task of clearing a town of a group of gangsters. Starting in your bedroom in a dilapidated hotel, you roam the streets of the town, and among the characters you will meet are a dancer, a shopkeeper who sells music cassettes, a blind tramp, an ice-cream seller, and even a gorilla! 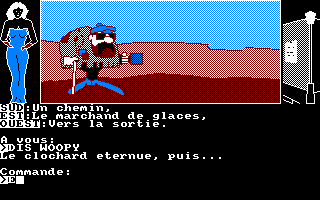 The game is a parody of an old text adventure called Masquerade that was released for the Apple II back in 1983. The pictures are OK, but there aren't many locations, and I don't like the way that some objects which need to be manipulated are hidden in the pictures but are not mentioned in the text. Overall, it's a mediocre game. The Markons have built a gigantic computer, the Brain of Markon, which has been sent out on a spaceship, on a mission lasting a thousand years to search for new lifeforms. However, the computer is under constant attack from Martianoids. You are the maintenance robot who must activate all nine sectors of the computer and repair it by picking up cones and using them. For each of the nine sectors to be activated, a program (represented by a piece of paper) must be guided from a transmitter to a receiver, using both yourself and the cones you pick up. This is quite difficult, as the program moves erratically. The graphics are lacking in colour and the sound is poor, and I found the game to be quite boring. The leader of MASK, Matt Tracker, must take on VENOM and rescue his stranded team. Controlling his Thunderhawk vehicle, he moves around four zones in search of them. In the first zone, you first have to collect the four pieces of your own MASK and connect them together using a number pad. Upon doing this, you then aim to collect the four pieces of your stranded team member. A scanner must then be used to locate and collect him. Collecting bombs allows you to blast away areas and open new parts of the zone. This is a very addictive game! The action/puzzle element is set perfectly and is mixed with smooth scrolling and clean, well defined and animated graphics, which makes this game a winner. See also: MASK II, VENOM Strikes Back. 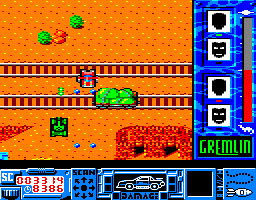 The MASK team must complete three high priority missions which take place in the desert, the VENOM base and the jungle. The missions are horizontally scrolling shoot-'em-ups, and in each mission you have a task to complete, including recovering a stolen ruby and finding a missile to destroy the VENOM base. 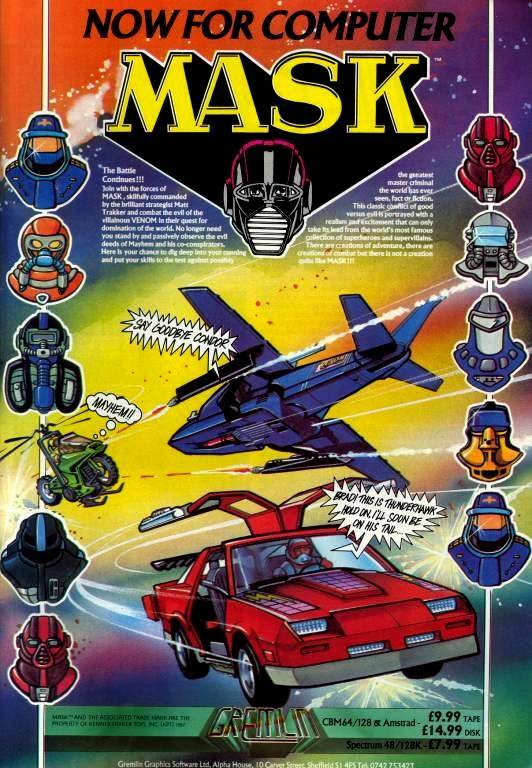 At the start of the game you select the MASK agents you want to deploy in your missions. 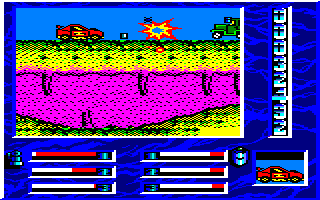 The artwork is quite cool, and the graphics are generally very colourful and move quite smoothly. Enemies are in abundance, bullets are flying all over the screen and you're always pressing the fire button to end their evil ways. It's a nice touch how the craft switch over, but it also can be frustrating, especially if your craft becomes completely damaged or you don't have the appropriate craft to suit the mission you are on. See also: MASK, VENOM Strikes Back. Another game with which to test your skills at chess. I'll say here that I have never been very good at chess at all, and if you're any better than I am, then this game won't present much of a challenge to you. One effect of this is that it doesn't spend ages thinking about its next move, which may be a good thing if you're impatient like me. Unfortunately, it also has some small bugs which make the computer perform some illegal moves, which can be annoying. You can save and load games, though, and rearrange the board if you want, but I think that any experienced chess player might find this game too easy for them. Three genies have been let loose. A young prince must reconstruct the three lamps and banish the genies in order to save the kingdom from doom. Each piece is retrieved by flying through a twisting tunnel on a magic carpet, and then listening to a sequence of notes and trying to recreate the sequence by hitting coloured gongs. It sounds rather strange, but once you play the game, you'll understand it quite quickly. The tunnel part of the game can be quite tricky to master, but fortunately there is an option to practice flying through any of the tunnels, and the game also offers two playing modes, where you can try to reconstruct only one lamp, or all three. 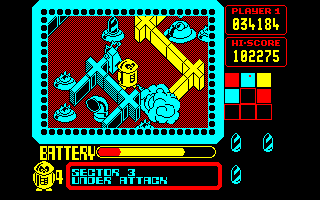 Although the graphics are simple, there are several excellent tunes to listen to, and the tunnel part of the game is great fun. If space shoot-'em-ups are your thing, you'll like this game. 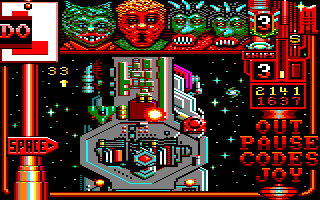 This was one of the last commercial games to be released for the CPC, and it's really rather good. 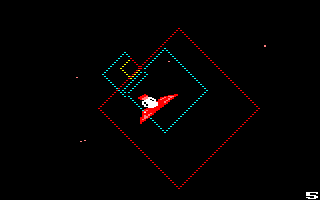 You control a red spaceship and must fly over several large mother ships, blasting aliens as you go. However, your spaceship has a very limited supply of oxygen, but it can be refuelled by collecting boxes left behind by the aliens when you shoot them. The only problem is that you cannot fire bullets until the box is collected! The graphics are very colourful and well drawn indeed, and when you combine this with powerful weaponry to collect, large explosions, great sound effects, and a wide variety of levels, you've got a fantastic game. It's a shame that it wasn't released several years earlier! The Cosmic Key has fallen through a time gate and emerged on Earth. He-Man must find the eight chords that make up the key before his arch-enemy Skeletor gets his hands on them. The main section of game involves wandering around a city looking for the chords; you will need to make a map, or you'll become lost. It also doesn't help that the orientation of north on the screen changes when you turn at a junction. Occasionally, you will be called to specific locations in the city to play one of a few very easy sub-games. The graphics and music are satisfactory, but wandering around the city is very dull, and the sub-games don't liven things up that much. Watch YouTube videos of this game by: jgonza, Metr81.